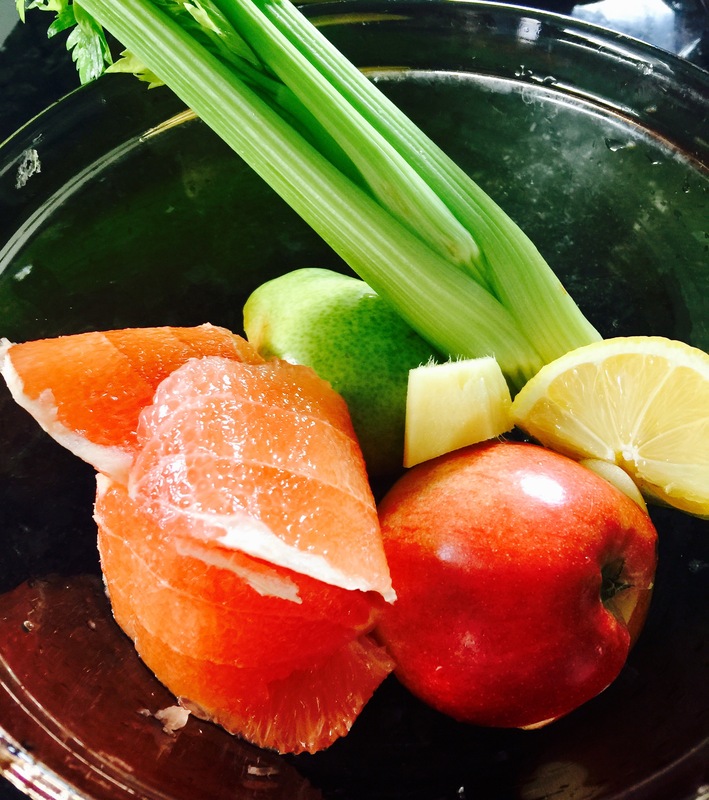 Today I kicked off a week of juicing, with my first full day of drinking my meals and snacks. Setting up the juicer this morning and keeping it rinsed and ready to go between creating juices made the day go smoothly. I discovered that prepping the fruits and veggies for each recipe and having them in a bowl next to the juicer helped too. I kept to my usual morning routine which included hot lemon water, 16 ounces of fresh celery juice and a fruit smoothie. 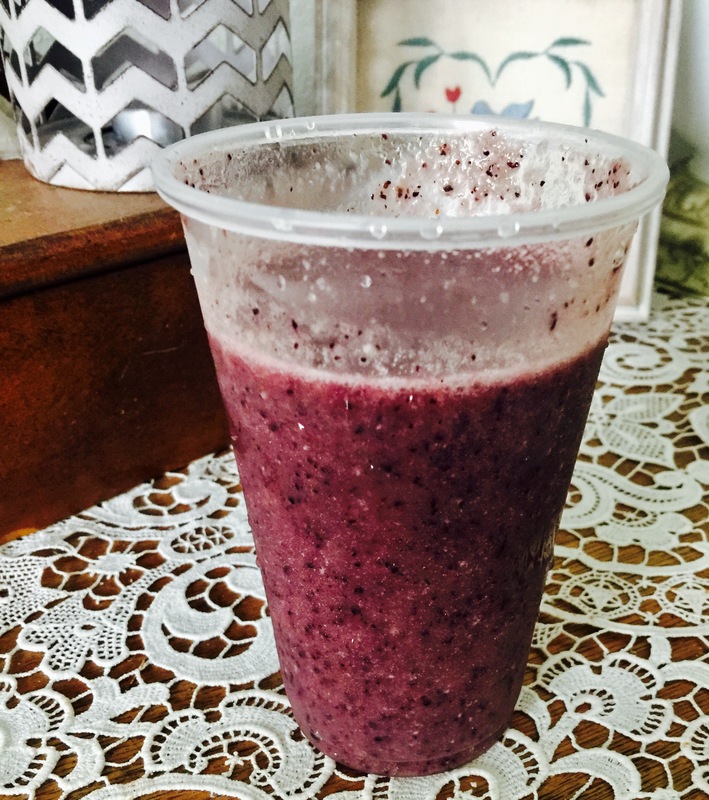 I like my morning smoothies…today I enjoyed a banana, mango, wild blueberry blend with hemp seeds…and I want to continue with those this week. They are liquid drinks after all, just blended rather than juiced. From there, however, the day shifted. I didn’t feel a need for a mid-morning juice, so I tried out my first new juice recipe at lunchtime, with the Mean Green blend. 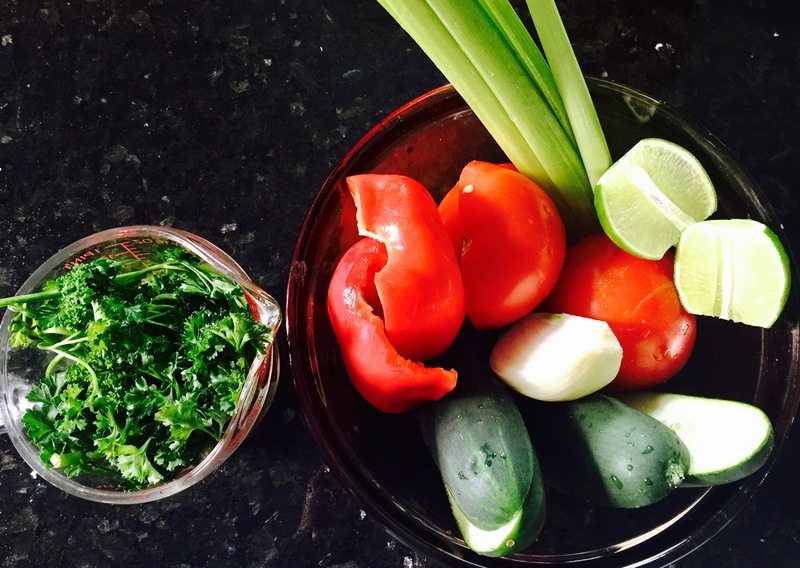 This green juice with a kick from fresh ginger was wonderful! 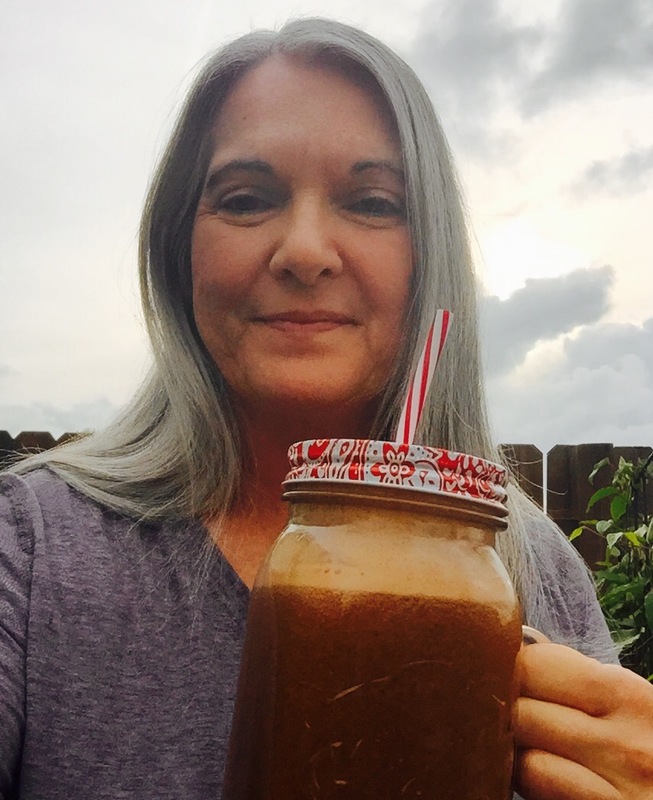 I learned creating this first juice to have all the fruits and veggies washed, trimmed or peeled, and ready to go. I didn’t peel most of the vegetables or fruits that I used today. For this drink, only the piece of ginger was peeled. I left the rind on the lemon. 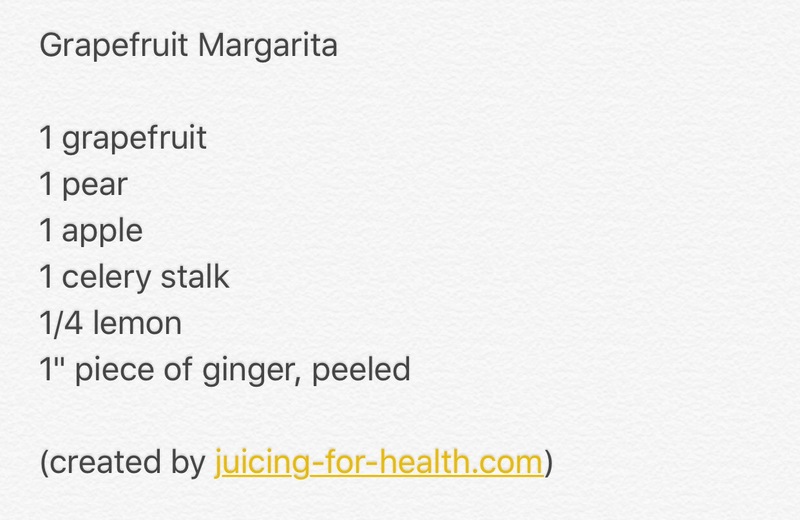 The mid-afternoon juice, Grapefruit Margarita, was my favorite today, and no, it didn’t really have alcohol in it. 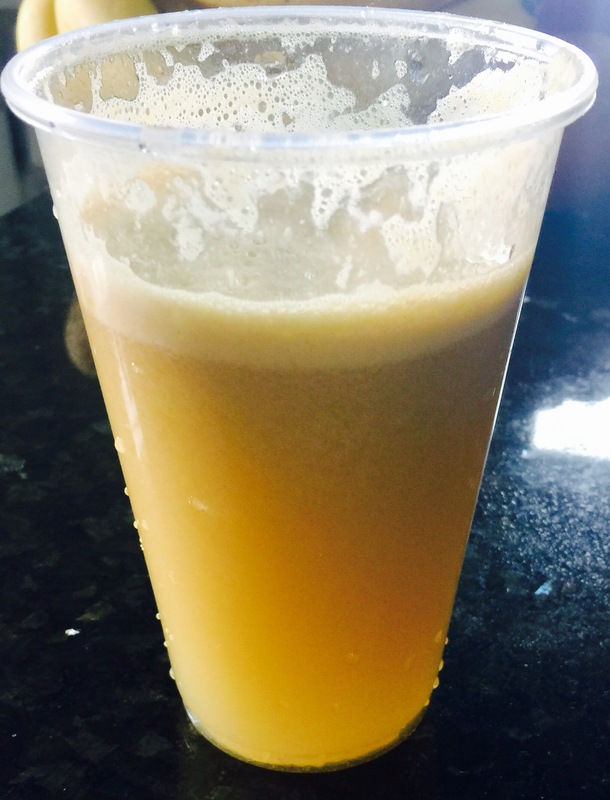 Light and refreshing, the grapefruit, pear, apple blend was perfect. Dinner juice was an interesting and robust mix of flavors, including parsley and onion, with a whole lime thrown in. 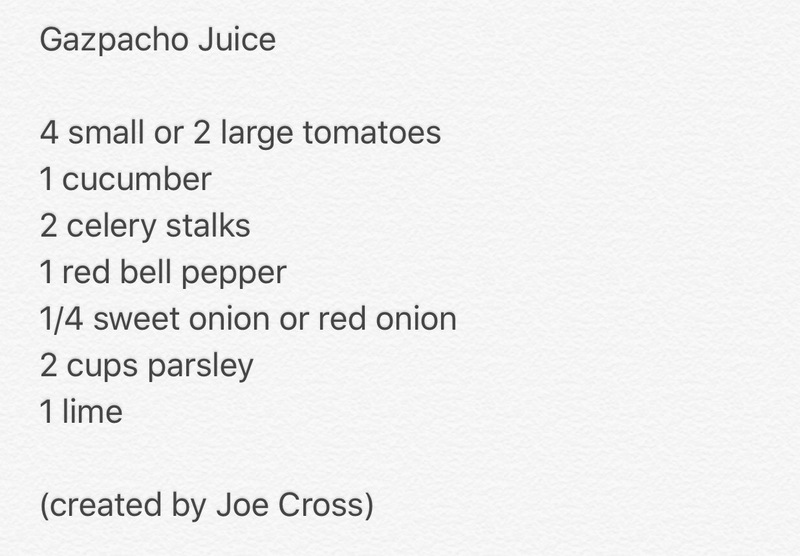 This recipe makes 32 ounces of delicious juice. I’m still sipping on it, which means I will probably skip the last planned juice this evening. 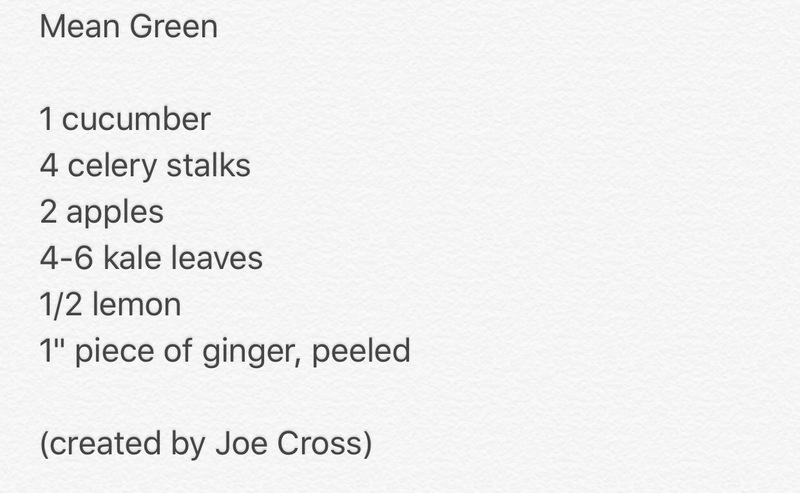 It featured a sweet potato, which is intriguing to me! I’ll include the Sunset Juice tomorrow. Instead, I’ll finish my day with a cup of hot nettle tea. I feel pleased with this first day of juicing. I have not experienced hunger or any feelings of weakness or tiredness. 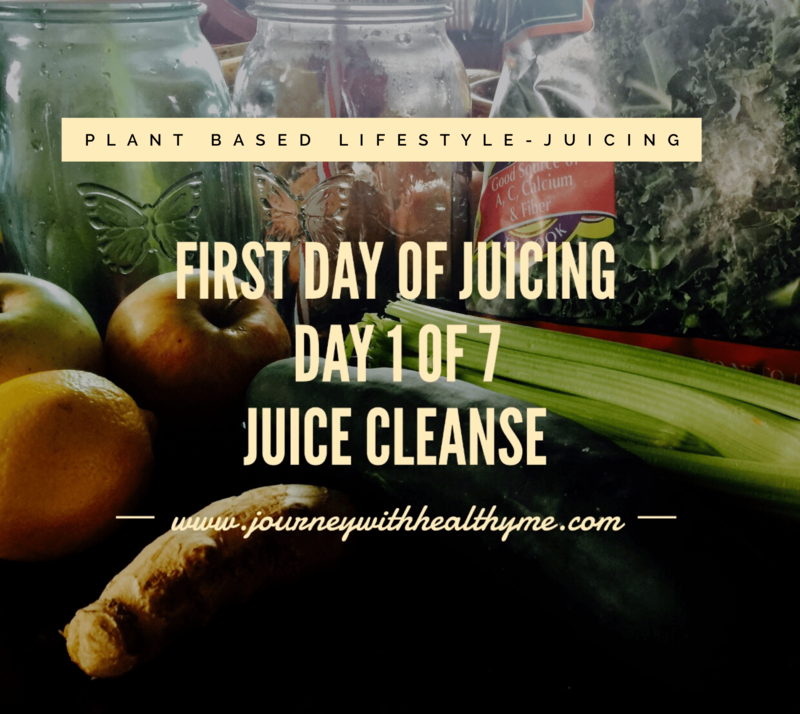 Perhaps because my body is used to a diet of fruits and vegetables, I have not felt ill or suffered from headaches or withdrawal symptoms, which can sometimes happen initially during a cleanse. Rather, I feel light, energized, centered and excited to see how the rest of the week goes. The only downside I have experienced today is that drinking so much liquid nourishment means I am visiting the bathroom more frequently. But that’s how a cleanse works…you pee a lot. The upside of drinking juices today is that I haven’t felt thirsty at all. My body is getting enough fluids along with a flood of nutrients. I love practicing this level of self care. I am continuing to heal my body with nourishment, and raising my awareness and my vibrational frequency at the same time. And tomorrow, I get to do it all again. You can order a very nice, mid priced juicer below, along with your own cute 32 oz mason jar drinking glasses, from Pioneer Woman. I am an Amazon Affiliate, and may make a commission on purchases, at no extra cost to you. Thank you for considering making a purchase of these products, or any other items, through my Amazon link!